If you’re like us, you never know exactly how much food to make, so you make—much too much. In our family, one of the greatest social sins is to run out of food. This year, we’re using this servings planner from Whole Foods Markets. Just enter the number of guests, and the tool will calculate how much you should serve. 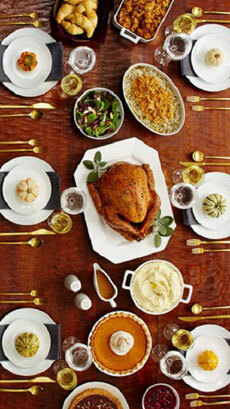 How much of everything do you really need (photo 1ThanksgivingDay)? If your guests are big eaters, or if you want lots of leftovers of a particular item, plan for 20% or 30% more—but not double the amount needed, as we have done.